Now while he was serving as priest before God when his division was on duty, according to the custom of the priesthood, he was chosen by lot to enter the temple of the Lord and burn incense. And the whole multitude of the people were praying outside at the hour of incense. And there appeared to him an angel of the Lord standing on the right side of the altar of incense. And Zechariah was troubled when he saw him, and fear fell upon him. But the angel said to him, "Do not be afraid, Zechariah, for your prayer has been heard, and your wife Elizabeth will bear you a son, and you shall call his name John. 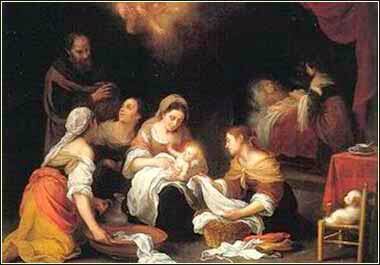 And you will have joy and gladness, and many will rejoice at his birth, for he will be great before the Lord. And he must not drink wine or strong drink, and he will be filled with the Holy Spirit, even from his mother’s womb. There are, throughout the Bible, a few extraordinary men who are destined to serve God before they are conceived. Often they are born to women past their child-bearing years, so that others will know that their very conception is miraculous. Samuel and Isaac are examples; and Samson, whose mother was also told not to let him drink wine, is even closer. But unlike any of these other men of extraordinary birth, John does not have a commission of salvation in his own life, so much as a role to prepare society for the coming of another. Although he will have the spirit and power of Elijah, perhaps the holiest man in the history of the Hebrews, his sanctity is preparation for one to come whose holiness is absolute: the Son of God. But we are getting ahead of the passage. John the Baptist was eclipsed in importance by Christ, but Luke here wants us to see what a great prophet John was, in his own right. He was the last of the Hebrew prophets. He would be a man of enormous spirit, bringing thousands back to the God of Moses and filling Israel with a spirit of righteousness. He was the equivalent of a great Christian revivalist, a man touched by God from before his birth, who was pre-ordained to lead Israel out of the morass of sin and disobedience into which it had fallen.